Don't expect it to be accretive to shareholders. Facebook (NASDAQ:FB) investors seem quite pleased with the company's announcement last Friday that its board has authorized a $6 billion share repurchase program. Shares had been having a terrible month so far thanks to a trifecta of negative storylines, but the stock jumped 4% yesterday. There is no time limit on when the authorization expires, and the program will officially kick off in Q1 2017. Facebook says that the repurchase program will be executed in line with its "capital allocation strategy of prioritizing investment to grow the business over the long term." Unfortunately, the $6 billion authorization isn't as impressive as you might think. There are many pitfalls in share repurchase programs, and this one falls smack dab in the middle of one. A stock buyback program that does not actually reduce shares outstanding does not deliver meaningful benefits to public investors. Sure, it can still mitigate or offset the dilutive effects of stock-based compensation, which is undoubtedly a good thing relative to not having the program, but buybacks that only do this aren't as beneficial. Like most Silicon Valley tech companies, stock-based compensation at Facebook is generous and pervasive. For instance, Facebook awarded $51.5 million combined to its top four executives under Mark Zuckerberg (who receives no salary or stock-based compensation) in 2015: COO Sheryl Sandberg, CFO David Wehner, CPO Chris Cox, and CTO Mike Schroepfer. In fact, Facebook has given out over $3 billion in stock-based compensation over the past 12 months alone, and shares outstanding have continued to meaningfully march higher in the years since going public. 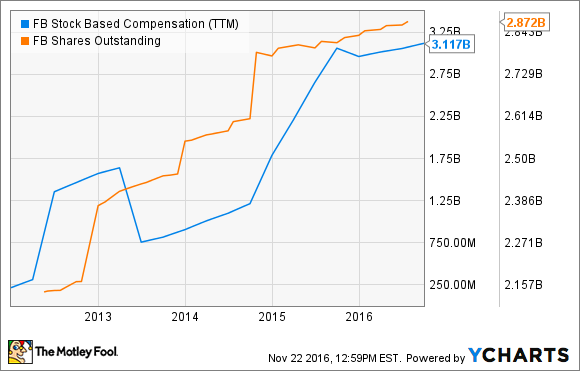 FB Stock Based Compensation (TTM) data by YCharts. Do you see the abrupt increase in shares outstanding in late 2014? Yeah, that's when Facebook closed the WhatsApp deal and issued a boatload of shares as currency for the deal (which I'm still worried about). None of this is to suggest that Facebook's share repurchase program is a terrible thing. Note that this was not actually framed as a capital return program, and there are no dividends being announced (not that Facebook is mature enough to start paying dividends). That should indicate that the program is intended to offset dilutive stock-based compensation more than anything else. The program is more of a starting point for future capital returns that may actually be accretive to shareholders. Facebook's business is firing on all cylinders, generating strong cash flows in the process. The company now has over $26 billion in cash on the balance sheet, of which $4 billion is located overseas. Since this is Facebook's first repurchase program, it's not clear what rate it will repurchase shares at. More than likely, Facebook will repurchase at a slower rate than it grants equity to insiders and employees, so this $6 billion authorization will probably last anywhere from one to three years.